I recently read the blog of a group that believes in the Book of Mormon, but disbelieves in almost all of the Doctrine and Covenants. When analyzing the Book of Mormon, this group sets aside the precepts of men and focuses on what is actually written and takes it at face value. Consequently, the blog demonstrates how teachings of the Book of Mormon differ significantly from the teachings of the modern LDS church. Yet when it comes to the Doctrine and Covenants, they don’t apply the same standard. I noticed a tendency to not always read what is written but sometimes repeat the modern LDS church’s interpretations of the Doctrine and Covenants. They correctly condemn those false teachings but then, incorrectly, condemn the Doctrine and Covenants without actually scrutinizing what is written. (Their disbelief in the Doctrine and Covenants has more basis than just this one element I will discuss, and my goal isn’t to try to prove them wrong, so we’ll leave the rest alone for now. This was just what sparked the idea for this topic). One particular criticism was leveled against D&C 76. This group discredited the correlated story that at judgement day everyone will be assigned to one of three kingdoms of glory: celestial, terrestrial, or telestial and that once placed in that kingdom, you will remain there forever. Had this group read D&C 76 with the same intellectual rigor they use with the Book of Mormon, they would have realized that D&C 76 doesn’t teach these things. But are we much better? Do we likewise ascribe to Section 76 false doctrines that it never teaches? Let’s take a look at what is really written. and they that have done evil, unto the resurrection of damnation. Verse 19 tells us this caused them to marvel. There doesn’t appear to be much difference between the two versions, as you can see above. But when you analyze it, there is more than meets the eye. In the KJV, there are two resurrections and they differ in the nature of the resurrection itself. One is a resurrection of life, the other a resurrection of damnation. Yet in the JST, the emphasis is on who receives the resurrection: the just and the unjust. From this snippet, one could conclude either that there are two completely different resurrections, or that there is one resurrection that happens at different times for different people, or there are two different resurrections that happen at different times. But there isn’t enough information so far to make a determination. The JST version also provides a link to the Book of Mormon. Alma 12:8 …What does this mean which Amulek hath spoken concerning the resurrection of the dead, that all shall rise from the dead, both the just and the unjust, and are brought to stand before God to be judged according to their works? Perhaps that’s why versus 18-19 indicate that Joseph and Sydney marveled and pondered this change…it opened a Pandora’s box of possibilities but in and of itself didn’t give any definite answers. Then they received the vision to explain it. While we won’t dive into this here, I find it interesting that the first part of the vision is a theophany where Joseph and Sydney see the Son on the right hand of the Father and received of his fullness and see the angels worshiping God. This is the same pattern that Isaiah (Isaiah 6), Stephen (Acts 7:55-56), Lehi (1 Nephi 1:8), Alma (Alma 36:22), and others experienced. This vision is consistent with other visions in scripture. It’s important to note that the sons of perdition do not comprise the resurrection of the unjust. As the scriptures teach, they don’t receive a resurrection. This is not the resurrection of the unjust, it is the sufferings of the ungodly! Immediately after talking about those who will receive no resurrection, the vision explains those who will receive the resurrection of the just. Notice nowhere in this section are the words “celestial kingdom” (other than in Bruce McConkie’s section header!). Verses 50-70 talk about bodies being celestial and their corresponding glory, and the things the people have done to qualify for this celestial body and glory. But these verses do not directly mention the celestial kingdom. This is a description of a people, not a place. Interestingly, D&C 76 declares that there is a resurrection of the unjust, but it doesn’t clearly define how it relates to celestial, terrestrial, and telestial. We have to use some logic to deduce that the resurrection of the just is only for the celestial people, and the resurrection of the unjust is for the terrestrial and telestial people. Verse 71 begins the brief description of the terrestrial category. We know from verses 54 and 67 that membership in the church of the Firstborn is a requirement for the resurrection of the just, and verse 71 tells us that these terrestrial people are not part of the church of the Firstborn. Verse 69 states that celestial candidates are just. Full; complete to the common standard. Full; true; a sense allied to the preceding, or the same. In a moral sense, upright; honest; having principles of rectitude; or conforming exactly to the laws, and to principles of rectitude in social conduct; equitable in the distribution of justice; as a just judge. In an evangelical sense, righteous; religious; influenced by a regard to the laws of God; or living in exact conformity to the divine will. Alma 63:2 – talks about Shiblon being a just man, like his brother Helaman. Mosiah 29:13 tells us that king Benjamin was a just man. Mosiah 19 – Limhi, the son of king Noah, was himself a just man. Alma 31 indicates that the word of God teaches us how to be just people. In order to be a just person, you need to obey the commandments (and then teach others to do likewise). The terrestrial category consist of those “without law”, those who “received not the testimony of Jesus in the flesh” because they were “blinded by the craftiness of men”, and those “who are not valiant in the testimony of Jesus.” None of these people qualify to be just because they did not obey the commandments, therefore the terrestrial appears to be the beginning of the resurrection of the unjust. Take a look at verse 71 again. Notice that they saw “the terrestrial world”. Not the terrestrial kingdom. The same thing happens when describing the telestial category. Verse 109 says they saw the inhabitants of “the telestial world”. Neither terrestrial kingdom, nor telestial kingdom, nor celestial kingdom appear in Section 76. The only kingdom referenced in D&C 76 is the kingdom of God (verses 7, 28, 79, 107, and 114). Let’s summarize. D&C 76 talks about a celestial category of people, but not a celestial kingdom. And it talks about a terrestrial and telestial world and the people that live in them. But no discussion of kingdoms, no discussion of these being assigned at judgement day, and no discussion about this being the state of the soul forever. Quite a bit different from what we’ve been taught that it says! In the next posts, we will focus on each category and analyze what the scriptures really say about them. 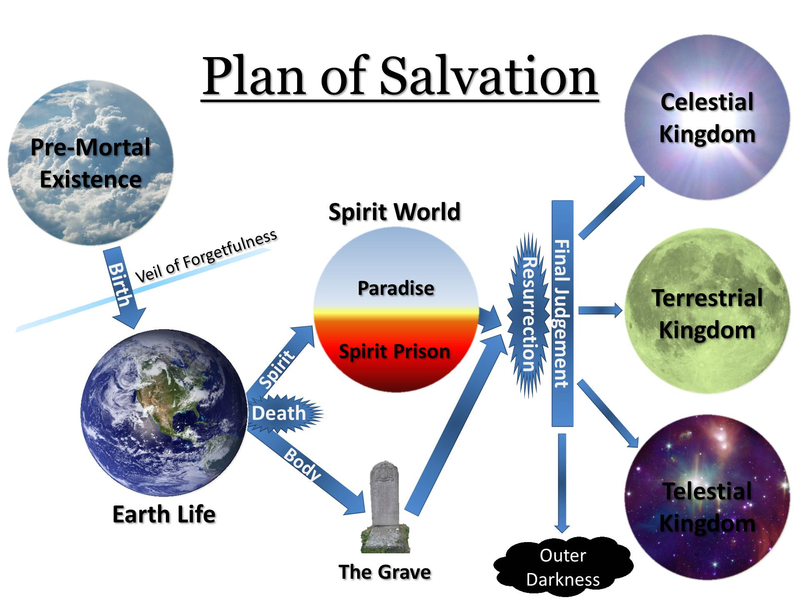 But I’ll warn you now, if you think the scriptures support the diagram below, you’re in for a rude awakening! This makes me so mad! I can’t believe all my life I have just accepted and believed what I was taught in the lds church, sunday school, primary, etc. I finally have realized I don’t need a scholor or prophet to tell me what the scriptures mean. You’ve done a good job at really analizing this and getting clarity and truth. Great job!